When fish hauls show signs of slumping in the 230 acres of Papua New Guinean coral reef managed by the Muluk villagers of Karkar Island, clan chiefs confer and will sometimes agree to restrict fishing for up to a year. 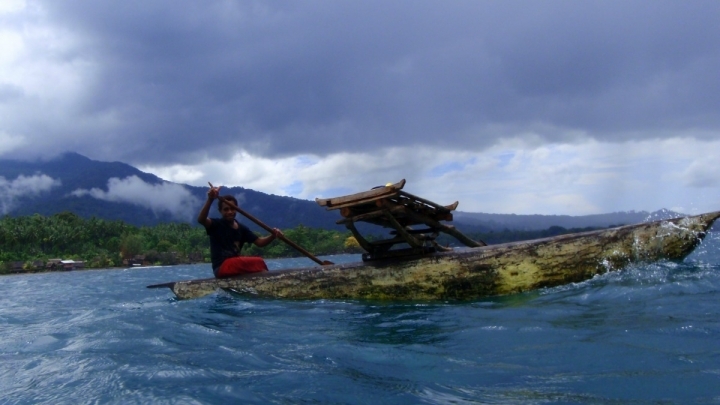 Fishing by outsiders is heavily restricted at all times, and fishing by villagers in different parts of the reef is guided by rules and customs. An unprecedented ecological analysis of fish survey findings from more than 2,500 reefs worldwide revealed on Wednesday that these villagers do better jobs than almost anybody in the West of managing fish stocks for the long term bounties they can provide. Karkar Island, Papua New Guinea. “We were interested in places that deviated from our expectations,” said Joshua Cinner, a social scientist at James Cook University, which next to the Great Barrier Reef is one of the world’s leading hubs of coral reef research. Cinner led the new study and will begin a fellowship later this year funded by Pew Charitable Trusts that will see him focusing heavily on coral reefs bright spots research. Some scientists expect such analyses will be key to sustaining forests and reefs in a world pummeled by environmental tumult. Coral reefs sustain fisheries that are relied on for the protein they can provide for growing populations. As the ecosystems are overfished, polluted, invaded by pests and warmed, as they endure oxygen declines, industrial pollution and acidification, and as worsening bursts of coral bleaching are followed by widespread coral deaths, experts are concerned that the collapse of fisheries will lead to famine. In a new quest for solutions, Cinner turned to an approach developed in the 1990s by Save The Children, which analyzed nutritional and health data to unearth fixes for child famine in Vietnam. The bright spot analysis led to vulnerable children being fed more crab and less white rice, alleviating hunger. A lot of work lies ahead, but the newly identified bright and dark spots in coral reefs worldwide could help scientists and public officials craft new strategies for better managing fisheries. Bright spots (yellow) and dark spots (black) identified in the new study. Credit: Cinner et al., Bright spots among the world’s coral reefs, Nature, 2016. Through the identification of bright spots like Karkar Island, factors that could influence fisheries size have been identified, such as fishing restrictions and fishing technology, but the findings are being viewed as preliminary. The new analysis showed fisheries get sicklier as the sizes of the markets in which they are traded expand from local levels to regional or global scales. It also showed marine reserves can help fisheries fatten up, but only when the fishing restrictions are observed, perhaps because of police patrols or local taboos. On-board refrigeration that allows fishing fleets to store their catches was found to deplete fisheries. So, too, was industrial fishing technology that allows fishing fleets to more effectively and efficiently plunder fisheries. Environmental shocks, such as tropical storms and coral bleaching, were found to reverberate for years through shrunken fish stocks — and those shocks are becoming more common or intense as pollution from fuel burning, farming and deforestation warms the planet. And the more heavily a local community depended on fishing for its livelihood, the more likely it was that the fishery would be a healthy one. That finding may seem counterintuitive, because it could result in heavier fishing pressure, but it’s consistent with economic theory. Kerr warned that more data and analysis will be needed to understand the relationships between fishing and environmental conditions and the size of a fishery that a reef supports. In particular, she said it’s often difficult to separate causes from effects. A school of Blackspotted rubberlip on a reef in the Western Indian Ocean. Bright spot analyses require extensive data to be gathered before meaningful findings are possible, making them substantial undertakings involving extensive collaboration. Cinner said he “asked about 30 different coral reef scientists to give me their life’s work” and “was just amazed by how helpful and interested they were. Cinner was working on the reef analysis for three years before it was published on Wednesday. 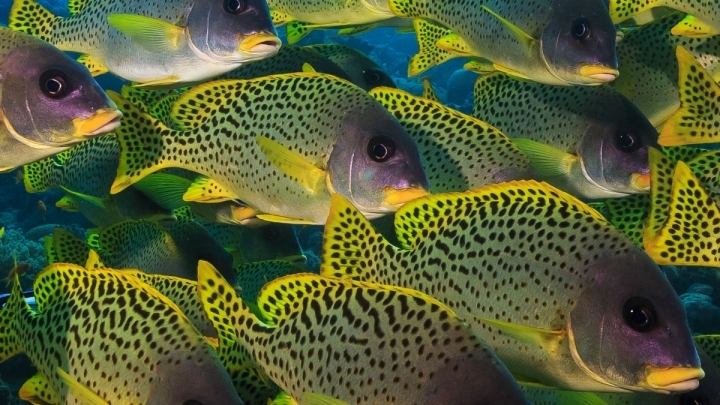 Survey results had to be heavily modified to ensure they were standardized, such as by only including types and sizes of fish in the final analysis that were surveyed in all of the reefs. The results are viewed as preliminary, but they nonetheless drew heavy praise from other scientists, including Peter Kareiva, director of the Institute of the Environment and Sustainability at the University of California, Los Angeles. Kareiva said the new paper may be the first of its kind, and that “the whole environmental movement should be looking for bright spot analyses,” which could help with strategies for meeting some of the world’s greatest challenges, including deforestation. Cinner credits Kareiva with sparking the idea for the study during a talk at a coral symposium four years ago in which he discussed the 1990s work in Vietnam and suggested a similar approach could unravel why some fisheries rebound from bleaching faster than others. With environmental disasters like bleaching becoming more severe and common in coral reefs as oceans become more degraded, and as greenhouse gas pollution continues to pile up in the atmosphere, understanding why some fisheries outperform others could become increasingly urgent. “One of the most concerning findings was the overriding impact of environmental shocks such as coral bleaching or cyclones,” said Deron Burkepile, an associate professor at the University of California, Santa Barbara who researches reef ecology and who wasn’t involved with Cinner’s study.